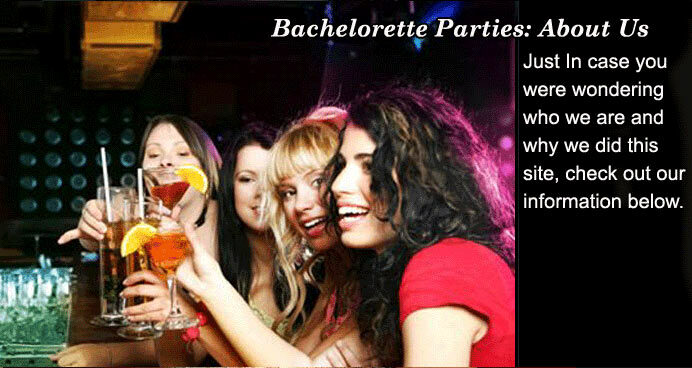 Bachelorette Parties 101 was created by a group of party planners who enjoy giving others free information regarding bachelorette parties to assist in reducing stress during a wonderful time. Our staff has over 20 years experience in planning bachelorette parties and have logged thousands of calls in helping bachelorettes make sure their parties are successful. Whether you are looking for bachelorette party tips, bachelorette party entertainment ideas, bachelorette supplies or just about anything, we will have information for you to make an awesome party. Let us know what you think and send in your ideas as we want to make bachelorette parties 101 a community site of sharing great ideas with one another! When first hearing about the engagement, many things may come to mind such as helping the bride-to-be with planning her bridesmaid dresses, bridesmaid responsibilities, the bridal shower and the bachelorette party planning. We only hope this site sparks tons of creative ideas in planning bachelorette parties with the ultimate goal for the bride-to-be and her friends to have a memorable time! Make sure to take a look at all of our free information on bachelorette parties since we cover everything you need to have in making planning much easier! Let us know any additional ideas you have on bachelorette parties by emailing us at bachelorette@bacheloretteparties101.com and we will get right back to you! Have a great Last Night Out and we hope to hear from you!